spoke up in Jay-Z's defense. In a recent interview with ed lover, Jay-Z spoke on the mild uproar. "I got a lot of money," Jay-Z offered. "You know when people get a lot of money, they start getting those rumors like Tom Cruise and Will Smith. That's ridiculous; that's crazy to me." 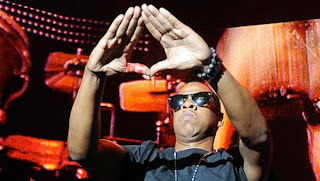 After again denying any kind of occult affiliation, Jay-Z added, "I think I need to remind people I'm from Marcy Projects. You can't get into those prestigious clubs. I can't even get into the golf club in Palm Springs." "Rap music is competitive by nature, so nothing suprizes me anymore," Jay said, in reference to the one-sided beef. "I can honestly say that one was a shocker. When you're cut from a certain cloth, there are things that are off limits. If you cross that line, it puts you in a different box. It comes from the same thing. I think people are running out of ideas and it's all marketing at this point. In the beginning it was competition. It was just like, 'Lets see who's better. Let's go to the square and see who's better.' It's all just marketing now. That's their whole marketing plan--Jiggaman. Beanie has since stated that he thought 50 Cent used his statements against him to further promote his latest album, Before I Self Destruct. Meanwhile, Jay-Z's Blueprint 3 tour continues on, and he says he's "got a bunch of ideas" but isn't sure if he'll release another full-length album in 2010.